It has taken nearly 34 years, but finally a lemon tree has been bred in the U of S greenhouses specifically for low-light conditions in an indoor home environment. 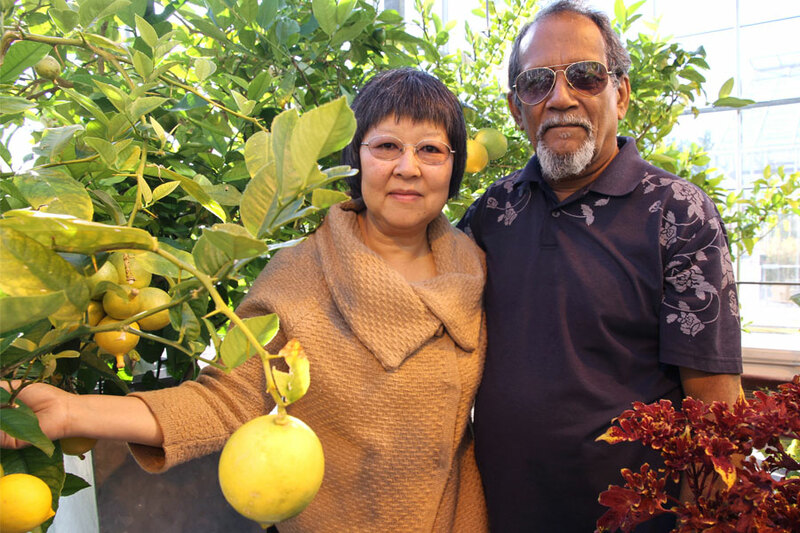 "It's been a long process," said Karen Tanino, a plant physiologist and professor in the College of Agriculture and Bioresources, who, with her spouse M.P.M. Nair, rents space in the greenhouses to breed the lemon trees. It was many years ago when a departmental assistant told her husband that lemons cannot be grown on the prairies, said Tanino. "You should never tell him he can't grow something," she added with a laugh. Lemon trees like heat and normally need lots of sunlight. They do especially well outdoors, in natural light under sub-tropical conditions with lots of space to grow. Given those parameters, it is not surprising they do not thrive in a prairie climate. "Basically, the concept is that in northern climates we are already heating our homes (so the temperature is suitable), but the home is a low-light environment, so a lemon tree needed to be bred for low light as opposed to high light or being in full sun," she said. Nair, explained Tanino, remembered a low-light citrus plant from South India where he was born. "He got a permitto import plant cuttings and began breeding lemons with this low-light tolerant plant." After all that time, a bit of stubbornness and a lot of patience, Nair bred a lemon tree that grows indoors with low light and in a small space – certainly not a conventional environment for a conventional citrus tree. "These lemon plants will produce about 12-16 commercial- sized fruit per year in a six-inch pot that fits on a windowsill," said Tanino. "This is the first time anyone has produced a low-light tolerant citrus plant ever. That's exciting." The first cultivar to be released is named Centurion to commemorate the centennial of the College of Agriculture and Bioresources, Tanino said, adding that other varieties will likely follow and will feature characteristics including seedlessness, edible leaves, edible flowers and having varying thicknesses and flavours of rind for candy making. "But it takes quite a long time to get through the release process." Tanino said she hopes this will lead to more food-producing plants to be grown indoors because "it capitalizes on the indoor living environment by using plants to convert the higher carbon dioxide levels into food and improve air quality."